Every time I see the trailer for the REAL STEEL movie, I can’t help but think of the Rock ‘Em Sock ‘Em Robots toys! Here’s more about REAL STEEL: Balancing gritty action and emotional heart, “Real Steel” is an inspiring and visually stunning film that takes audiences on an action-packed journey. Washed-up boxer Charlie Kenton (Hugh Jackman) scrapes by as a small-time robot-fight promoter as he tries to make a comeback. Against all odds he eventually succeeds—at least in the eyes of his son Max (Dakota Goyo). “Real Steel” is spectacular family entertainment that will have everyone cheering again and again. Whether you’ve seen this movie or not, DreamWorks Studios’ Action-Adventure With Heart, “REAL STEEL,” Starring Hugh Jackman, Enters the Home Entertainment Ring on Blu-ray™, DVD, Digital and On-Demand January 24, 2012. 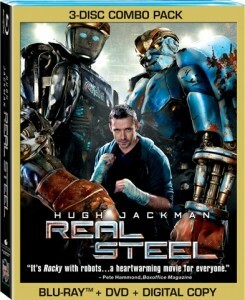 DreamWorks Studios’ REAL STEEL, starring Hugh Jackman, muscles its way into the Home Entertainment arena on Blu-ray™, DVD, Digital and On-Demand on January 24, 2012. This visually stunning action-adventure filled with heart and soul is a “must-add” to every home movie collection, delivering a premium in-home experience complete with knockout bonus materials that dive deeper into the action. The Blu-ray Combo Pack, with its perfect picture and sound, delivers the ultimate punch, offering viewers a variety of supplemental bonus features that take them ringside with Director Shawn Levy on the making of the film. Exclusive features include a bare-knuckled exposé of the life story of Charlie Kenton (Hugh Jackman), deleted and extended scenes that go deeper into the film and storylines, and a riveting profile with legendary boxing champion Sugar Ray Leonard. Plus, the revolutionary Real Steel Second Screen app lets viewers sync their iPad™* or computer with the Blu-ray movie to peel back layers of effects with progression reels, check out 360-degree turnarounds of the robots, explore seamless branching pods that delve into the cutting-edge technology used to create the fights, and much more. The #1 movie in the country for two consecutive weeks during its theatrical run, REAL STEEL is directed by Shawn Levy (Night At the Museum franchise, Date Night and What Happens in Vegas), produced by Steven Spielberg (Saving Private Ryan, Schindler’s List), with a screenplay by John Gatins (Coach Carter, Summer Catch). Set in the not-so-distant future where boxing has gone high-tech and 2000-pound, 8-foot-tall steel robots have taken over the ring, the film stars Hugh Jackman (X-Men franchise, Australia) as Charlie Kenton, Evangeline Lilly (TV’s Lost, The Hurt Locker) as Bailey Tallet, Dakota Goyo (Thor) as Max Kenton, Kevin Durand (I Am Number Four, X-Men Origins: Wolverine) as Ricky, and Anthony Mackie (The Adjustment Bureau, The Hurt Locker) as Finn. Comments for Real Steel coming to Blu-Ray and DVD are now closed. Copyright © 2019 Movie Vine.